The Official Website for Left Behind or Led Astray? A website dedicated to taking a closer look at the history of the secret pre-tribulation rapture doctrine, pre-trib leaders, their teachings and what the bible actually teaches on this subject. Find out more by watching our exclusive documentary, Left Behind or Led Astray? In June of 2016 Pastor Joe Schimmel and Dr. Doug Stauffer debated the theology of dispensationalism, as well as the history and the timing of the rapture as revealed in scripture, at the Pikes Peak Prophecy Summit hosted by Prophecy in the News in Colorado Springs, CO. Upon returning home from “The Great Rapture Debate” between Dr. Doug Stauffer and Pastor Joe Schimmel in Colorado Springs, CO on June 19, 2016, I have been asked many times about my opinion of how the debate went. We developed this section of our Left Behind or Led Astray? website to deal with criticisms from a biblical and historical standpoint. 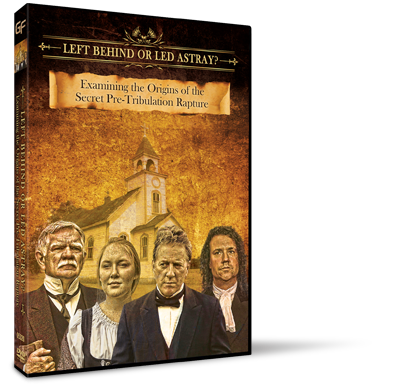 This page provides answers to those critics who have reviewed our DVD, Left Behind or Led Astray? and have put forth challenges to issues raised in the film. The content was excellent and well presented and it is indeed an effective tool for addressing Pre-Trib preachers and authors themselves...What you have is good and effective for challenging Thomas Ice, Paul Wilkinson, etc. directly...The body of evidence you present in 'Left Behind or Led Astray' is insurmountable and forcefully presented and it will knock the Pre-Trib camp for the proverbial six. This is one of the most important videos to come out in the past 20 years...this is a watershed product. Your superb new video on pretrib history arrived earlier and a friend, my wife and I were riveted and thrilled all the way through both discs. Many thanks! You have to be some sort of Christian Einstein! Great job. I have been through the video twice now and I thought you did a superb job. In my view, your examination of the development of the pre-trib teaching in the 19th century is ABSOLUTELY DEVESTATING to the pre-trib view and should convince anyone who examines the evidence with an open mind.